Olive Oil Sufganiyot (Jelly Doughnuts)Have you ever heard of sufganiyot? Even if you’ve never heard of them by name, they probably look familiar, because they are in fact a variety of a well-known food: jelly sufganiyot. Sufganiyot (pronounced soof-gan-ee-ott) are a particular variety of fried jelly sufganiyot which are often served at Hanukkah. Oil-based foods are traditional fare during Hanukkah, and sufganiyot (or sufganiyah for a single unit) are one of the more popular delicacies. This recipe is a fine illustration of why these sufganiyot are so beloved. 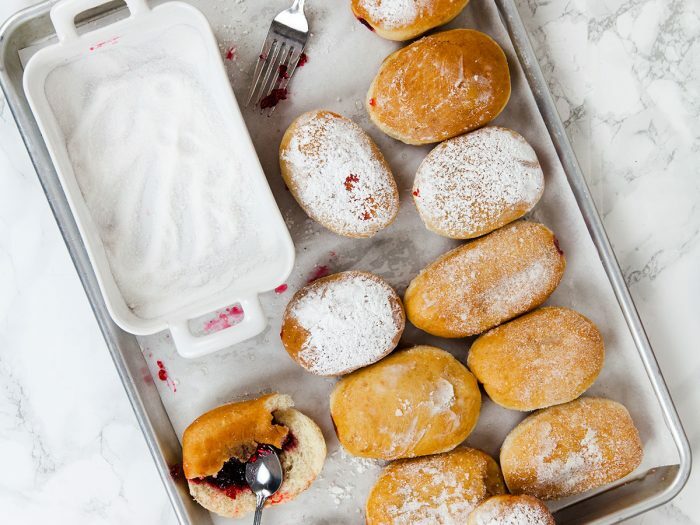 Lightly sweet, pillowy dough is fried to light and fluffy perfection in Colavita Olive oil, which imparts an inimitable flavor on the finished sufganiyot while also imparting a light texture and pleasingly crispy edges. Piped full of seedless jam and topped with a snowy dusting of confectioners’ sugar, they have just the right amount of sweetness. These sufganiyot would make a fine morning snack, but taste good all day long.